Well, not so long ago, I made creme brulee. What you didn't know is that I made it specifically for the purpose of putting it into this cupcake! 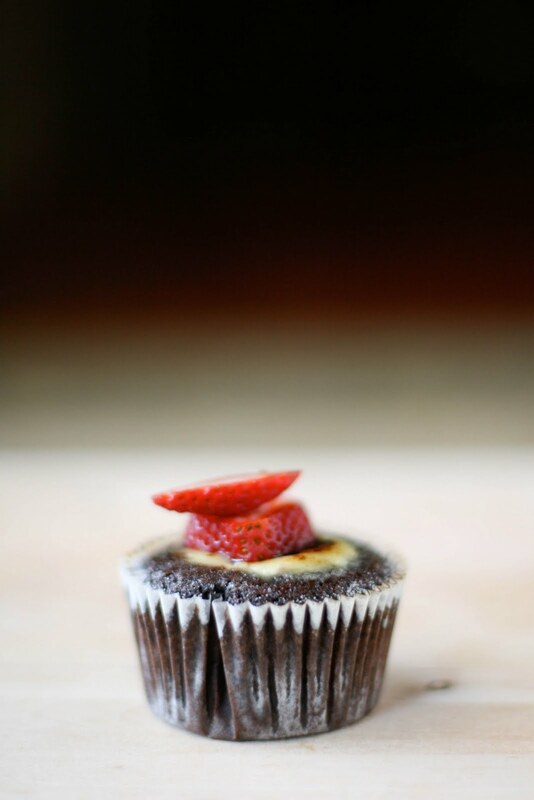 Crème Brûlée cupcakes, yes, they are not only a figment of your imagination - they are real and they are divine! When I came across the concept, I gasped, was awed, motionless in shock and wonder. Once I wrapped my head around it, it just made sense, why not?! Tucked inside of my favorite chocolate cake recipe (black magic cake) is a creamy, uberly light creme that is then torched to a crisp so you still get that classic creme brulee. Topped with some fresh berries, and you are basically set to conquer the world - yep, I said that! Inspired by this. Crème Brûlée recipe from here. Prepare the baked cupcakes by using the 'cone method' to remove some of the center of each cupcakes, leaving about a 1/2 centimeter edge on each cupcake and about 1 - 2 cm deep, set aside. To make the creme brulee, preheat oven to 300 F. In a heavy bottomed saucepan, heat the cream with the vanilla bean over medium low heat for 15 minutes, stirring to ensure it does not burn; DO NOT let it boil. Remove from heat and let steep for 15 minutes. Remove and discard the vanilla bean. Strain the cream through a fine mesh sieve. Meanwhile, in a mixing bowl, beat the egg yolks with an electric mixer on high speed for 5 minutes, or until light and fluffy. Gradually beat in 1/4 cup plus 1 tbsn. sugar. Add about half of the cream mixture, a little at a time, to the egg mixture, whisking until well blended. Then pour the egg mixture into the remaining cream mixture, stir until completely blended. Pour into 4 (9oz.) ramekins or custard cups. Place the dishes in a large baking pan. Pour enough hot water into the pan to come halfway up the sides of the ramekins. Bake for 35 - 40 minutes or until the mixture is set in the center (it shouldn't wiggle when shaken). Carefully remove the dishes from the baking pan. Let cool to room temperature and then refrigerate for at least 2 hours, or up to 24 hours. 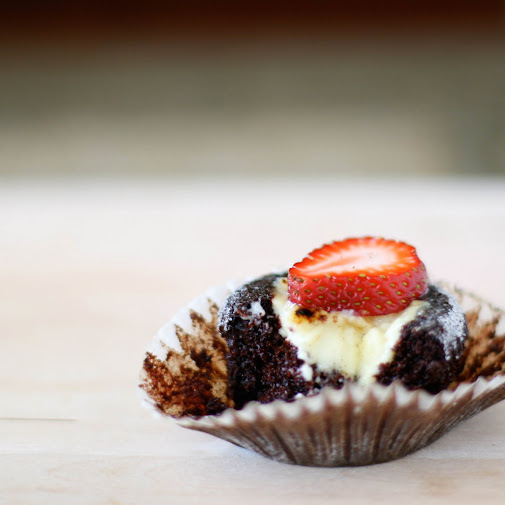 Once cool, use a spoon to fill your cupcakes with the creme, using a spatula to flatten the tops. When ready to serve, sprinkle the Crème Brûlée with sugar to coat, then use a blow torch to brulee the tops and caramelize the sugar. If desired, you can top with some fresh berries! What a wonderful idea! These look delicious! When I saw this picture my heart kind of melted -- you are a genius! Creme Brulee = awesome Chocolate Cupcakes = always put two together and that equals you are always awesome -- okay that was horribly corny haha beautiful recipe Michelle! That looks divine! I've never made creme brulee at home because I don't have a torch. Time to add that to my shopping list! What an AWESOME creation, Michelle. 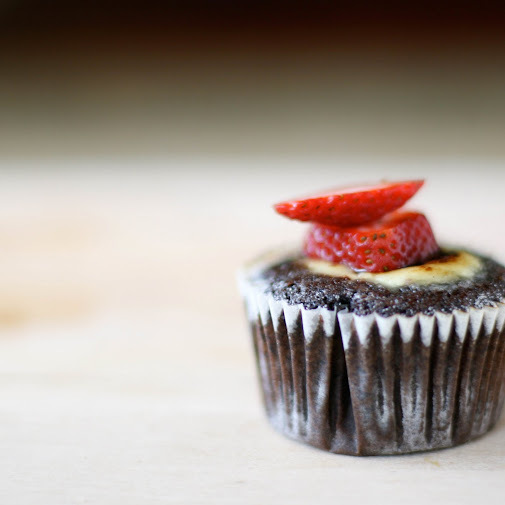 I've made a supposed creme brulee cupcakes before and while they tasted awesome, yours IS the real thing. Fantastic! That sounds awesome! I definitely want to give these a try, I love creme brulee. I am inspired too, must try these pretty delights!